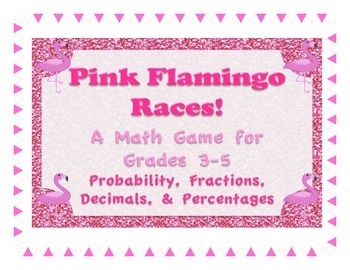 Fair warning—they go insane over this game and beg for it, often so engaged that they get quite loud and animated as they do the math to determine very basic, easy examples of probability, fractions, decimals, and/or percentages. This is a tried and true classic from when I was the math special at my school, charged with making math fun to reinforce concepts learned in their classrooms. Now, I use it with my 5th grade gifted and high achievers, and they still love it. I hope your students will too! Complete instructions, including how to modify based on desired math focus area, and whether indoor or outdoor play is more convenient. 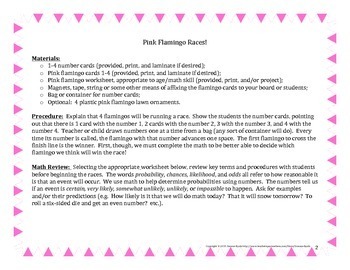 Very few materials that are not included are required, and all are just suggestions that can be modified easily, such as tape OR magnets to affix cards to your white/chalkboard—but if you do happen to have 4 of those plastic pink flamingo lawn decorations, and conditions that permit outdoor play, the kids see that variation as an amazing treat! 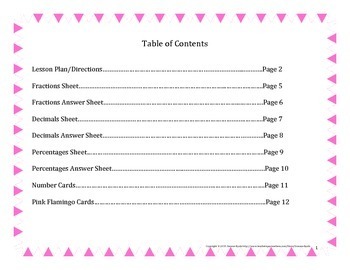 Thanks to Kristy Bear Designs for the pink glitter background used on the cover page! 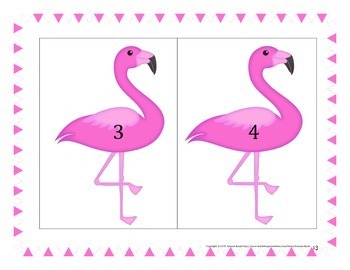 Thanks to Dancing Crayon Designs for the pink flamingo clip art! Straight-A feedback is always appreciated, as is letting me know if there's a problem before leaving anything else. I am always looking to improve! Click the star above to follow me for notifications of sales and new products!